All account holders will begin their loyalty journey at Club level. For every R2.00 you stake on a losing bet, you will earn 5 loyalty points. At SIlver level you will receive a 25% increase from Club level in your loyalty point earnings. 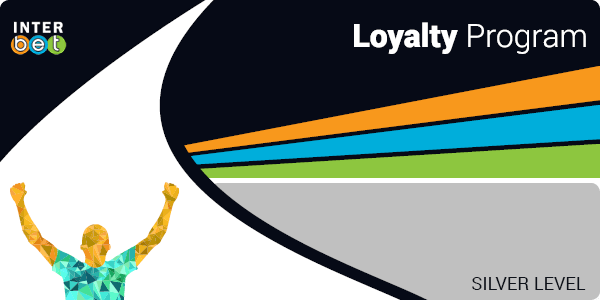 This means that for every R2.00 you stake on a losing bet at Silver level, you will earn 6.25 points back in loyalty. At Gold level you will receive a 50% increase from Club level in your loyalty point earnings. This means that for every R2.00 you stake on a losing bet at Gold level, you will earn 7.5 points back in loyalty. At Platinum level you will receive a 100% increase from Club level in your loyalty point earnings. This means that for every R2.00 you stake on a losing bet at Platinum level, you will earn 10 points back in loyalty. Start earning loyalty points from day 1! Points can be redeemed for betting credits in increments of 1000. From your very first, real money bet you can start earning loyalty points based on the amount staked and lost. This Program does not require you to apply for membership so you will never miss out on points – as long as you maintain your level. Once you start betting, your level status will automatically update based on your play. The more you bet, the more you earn. And once you have reached a certain tier status you can maintain the status that you have earned through maintenance points. Points will not just be earned from your rands ventured, but also from the types of bets you place. For every R2.00 you stake on Tote, Numbers, Fixed-Odds and Live Betting, you will earn 5 points if the stake returns a losing result. Loyalty Points will only be added to your account pending the outcome of the bet you have placed. For Fixed-Odds, all single and multiple bets apply. This does not apply to the Exchange, where you will not earn loyalty points on single bets. Loyalty points are not earned on bets with odds of 1/10 or lower. The loyalty program is only available to leisure punters. Bookmakers and professionals are excluded. Professional punters will be deemed so at the discretion of management. In order to remain at Silver, Gold or Platinum level you will need to earn a certain number of maintenance points see below for details on maintenance points. Loyalty points must be redeemed by a member within a period of 90 days from the date on which such loyalty points were awarded. All Loyalty Points earned but not redeemed within the 90 day period will be subject to automatic expiry. Your Loyalty Status, that is, your loyalty level will earn you a proportional increase in your earned loyalty points, when you reach silver level and above. For example, by achieving Gold level status, for every R2.00 you stake on Tote, Numbers, Fixed Odds and Live Betting you will receive 7.5 loyalty points if the stake returns a losing result, instead of the 5 points earned at Club level. Every 1000 points earned can be redeemed for R1 betting credits, giving you a larger betting bankroll. Points may only be redeemed in increments of 1000.